We offer a variety of unique handcrafted wood and poly windmills in several sizes and colors. If you don't see the style you are looking for on our website, give us a call and we will see if one of our companies has the style you are looking for available. Ornamental lawn windmills. Unique, handcrafted Dutch Windmills for the lawn. Available in pressure treated wood or recycled poly (maintenance free lumber). Note: Styles, availability and prices subject to change without notice. These Dutch Windmills are made with maintenance free recycled lumber and stainless steel fastners. 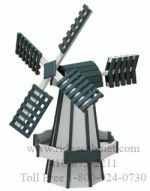 The Dutch Windmills come in your choice of colors There are 2 sizes available. 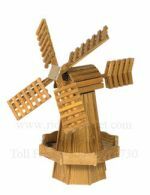 These Dutch Windmills are made with pressure treated yellow pine lumber and stainless steel fastners. The Dutch Windmills come unfinished or with a water sealer. There are 3 sizes available.